Tickets are $25, and go on sale to the public 10 a.m. CT Nov. 2 at acm-uco.eventbrite.com. Original Flow and The Fervent Route will open. In 2016, her debut album, the “Telefone” mixtape, found the artist introducing herself to a worldwide audience. Describing the project as “an introductory conversation with someone you’re interested in,” she quickly earned everyone’s attention. 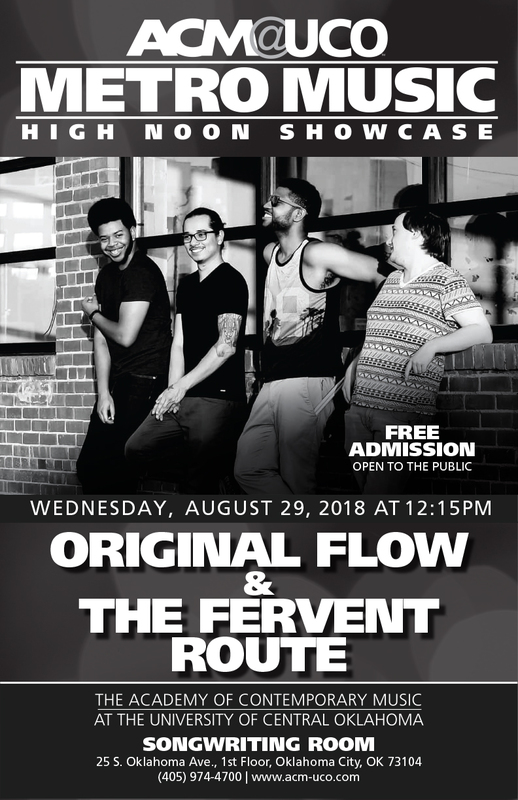 Original Flow and The Fervent Route is a hip-hop band that mixes high-octane lyrical content with old-school delivery. See it live during its High Noon Showcase gig, happening 12:15 p.m. Aug. 29 inside ACM@UCO’s Songwriting Room, on the school’s lower level, 25 S. Oklahoma Ave. Original Flow, aka Chris Acoff: He’s a wordsmith with a message, defying mainstream music molds with his conscious lyrics of positivity and triumph. 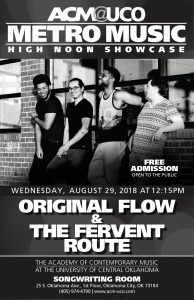 The Fervent Route: Soulful (Josh Carpenter) delivers eclectic influences including gospel, jazz, rock, hip-hop and soul. Android (Andrew Wood) incorporates indie, pop and electronica. DanYoSon (Daniel Acuna) indulges Spanish R&B, Motown, and classic rock sounds. The band’s members also include ACM@UCO alumni. The High Noon Showcase is part of ACM@UCO’s ongoing Metro Music Series, celebrating the school’s 10th anniversary! Find photos, videos, music and more at theferventroute.com/media.